If your computer will boot up from the hard drive, press F8 during the startup sequence to load the startup menu options. "Repair your computer" will be the first menu option. Select it and press Enter to load the Windows RE. If your hard drive will not boot, you will have to boot from your Windows 7 installation DVD or a System Recovery Disk. Both types of disk have the "Repair your computer" and Windows RE on them. If you haven't previously taken the time to make a Recovery Disk, see my related article Recovery Disc for Windows 7. If you have neither a Windows 7 installation DVD nor a System Recovery Disk, there is a third (but awkward) workable option. Remove the non-booting hard drive from your computer; install it as a secondary drive in a working Windows 7 computer; reboot the computer; and run "Repair your computer" from that machine's hard drive. You can select your non-booting drive as the one to repair. After selecting "Repair your computer" you will have to choose your keyboard input method and language (if you've installed multi-language support), then enter your username and password to gain access to the Recovery Options menu. "Startup Repair" is an automated diagnostic and repair program that attempts to analyze and fix corrupted startup components on the specified drive. Choose it if your hard drive won't boot or Windows will not load. "System Restore" returns your Windows 7 installation to a state saved at an earlier date, called a System Restore Point. System Restore Points are automatically created at various times, and you can always create one manually. The idea is to roll back your system in time to a point where it was working normally. "System Image Recovery" uses disk images created by the Windows Backup and Restore to replace corrupted data and/or system files with backup copies. It is different from System Restore in that the latter does not make backup copies of user document files or application programs. With System Image Recovery, you can restore any of your applications and data as well as just Windows 7 system files. 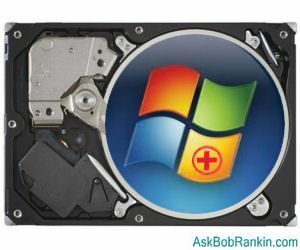 Most recent comments on "Windows 7 Hard Drive Recovery"
Your hard drive recovery article didn't cover the most pervasive of the hard drive problems where the Service Area fills up and without any warning the drive is suddenly no longer recognised by the BIOS. Is there anything that can be done when this happens or is everything lost. EDITOR'S NOTE: I've never run into a problem with the hard drive service area. This is where the drive's firmware is stored, as well as the list of bad sectors and calibration data. In order for this area to be "full", you'd have to have some pretty serious problems with your drive. Short of using a professional data recovery service, you might try formatting the drive. Microsoft Security did a automated update today and during the reboot process my Win 7 machine did a CHKDSK automatically. I've had hard drive problems before in a Vista machine considering the PC is next to a open door to a very dusty backyard. I wonder if this is related? Just spent the better part of two days trying to diagnose/repair my laptop. Tried using a system image on an external hard drive. All three of the images resulted in BSOD. Next tried the "Repair your computer" option by booting from the install disk. Following all the various prompts was an exercise in futility. Finally restored my machine to it's original factory condition by using the manufacturer's backup and recovery manager hidden partition. But now whenever I try to shut down the machine (Start orb > Shut down button) the main power button keeps flashing. Never used to do that before. And yes, I double checked all power option settings to make sure everything was set to shut down and not hibernate or sleep. Very frustrating. Still somewhat skeptical of the value of certain Windows "self-healing" features, I had opportunity recently to do a "Repair your computer" with a Vista Home Premium installation after a minor dysfunction. At the repair prompt, I let Windows go for it, and waited expectantly. After chugging away for a long, long time, Vista eventually screened the message "Unable to repair...". Frankly, I was neither surprised nor particularly disappointed. This was a test of Windows, not a major disaster-- for years, I have known better than to place all hopes on Windows working as advertised. Yet, for millions of Windows users, a system crash is definitely not the time to put all bets on Windows repairing itself. Because so many things can go wrong with Windows, and usually do, more users might be harmed than helped by letting Windows attempt to repair itself. Put another way, what if the automated "repair" is not truly a proper repair? The fundamental problem is a Windows Vista or Windows 7 user has no idea what he has allowed Windows to do to itself. I am reluctant to let Windows do anything behind my back for the same reason I do not click on websites which offer to fix all my Windows issues-- if only I will click on the website's big Magic Green Button and let the website do what it wants. With Windows 7 self-repair, however, mileage may vary. Eventually, Microsoft gets some things at least halfway right. I hope some Windows 7 users will volunteer wonderful tales of rescue from Windows 7 self-repair. Hello Bob! I have a Toshiba L305D series laptop with Win7 and a HD that crashed after only 11 months operation. It won't start and doesn't have a disc drive that I've been able to find, though it may, in fact, have a disc drive. If you believe it does, I'd very much appreciate your telling me where to find it and how to open it. Is there a USB device that will work to repair the Hard drive like the discs you suggest using to repair the HD in a PC that won't boot? Thought I was safe used them and failed to work. When I tried all options said all files were corrupt.Will never trust them again. System restore points mostly offer a false sense of security, my experience anyway. These days, unless you built it yourself, most computers don't come with install disks, only the cheap "hidden restore partition". That might get you back to an "original" computer, but all of YOUR stuff is gone. For me, the only way is to have a full image backup available. I first used Norton Ghost (saved me several times), then for years used Acronis (again, a number of saves). Now I use Windows Home Server. One of the best things about WHS is its backup capability. Incremental backups of all the computers on the network, every night, automatically. Plus, it keeps only 1 copy of any file, regardless of how many computers that file is on (speedy backups, slow backup deletes, which is fine by me). And yes, I have used those backups to restore. In some ways, it's too nice: easier to restore to a working config than figure out what went wrong. Worth the money? How much is your data worth? All those digital photos? Not like you have negatives in a box on a closet's top shelf anymore. And how much time will it take to re-install and configure all those apps? I consider image backup software just like paying for fire insurance - you hope you'll never need, but VERY happy to have in case you do. In the one paragraph that says, "Remove the non-booting hard drive from your computer; install it as a secondary drive in a working Windows 7 computer; reboot the computer; and run "Repair your computer" from that machine's hard drive. You can select your non-booting drive as the one to repair." EDITOR'S NOTE: Does the second drive get recognized as a drive letter after booting? "If your hard drive will not boot, you will have to boot from your Windows 7 installation DVD or a System Recovery Disk. Both types of disk have the "Repair your computer" and Windows RE on them". The very first Win 7 install DVD (direct from from Lenovo) gives one and only one option, completely reinstall Win 7. I wish it had "Repair" or RE on it like XP Recovery Console so I could, at least run chkdsk. I do have personally burned single CD, "Repair Disc" but the menu fails to get to the page where it asks for Username and Password. Hangs. F8 screen for Safe Mode options doesn't work. Safe Mode choices all hang and hang for hours. The Repair button on top fails too after hours of doing something but did say "registry is corrupt". 3 month old laptop and now this. There are several ways to perform Windows 7 hard drive recovery, depending on what sort of damage has been done. The easiest Win7 hard drive recovery technique is to check the drive for errors and repair them using the CHKDSK utility..